Snooper DVR-4HD performs two very different but useful fuctions all while it's mounted on your vehicles windscreen. Firstly, the DVR 4HD alerts to speed cameras via a free subscription, and secondly it features a full HD 1080P in-car camera to record traffic incidents. Buy accessories for the Snooper DVR-4HD. 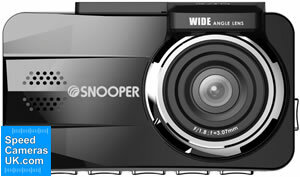 The Snooper DVR-4HD is a dashboard camera and a speed camera detector with FREE speed camera updates for the Lifetime of the product. 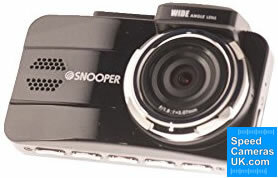 The Snooper dash cam will record in continuous, loop recording mode which means the Snooper will record over old videos as the microSD Card becomes full. Recordings are made in 1080p Full High Definition. A 16GB microSD is included in the box and this can be upgraded to a maximum of 32GB. 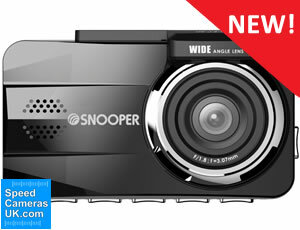 The Snooper DVR-4HD has a 3.0-inch TFT LCD LCD screen for viewing back video instantly. Parking mode relies on the internal battery to provide power to capture events when your vehicle is parked. GPS technology not only tells you where all the fixed speed cameras are it also records your journey. You can then view your journey on Google Maps. 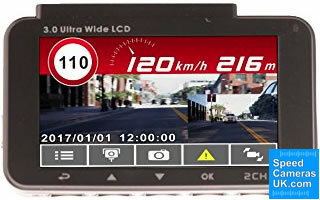 The dashboard camera is a 2 Megapixel camera that will capture high-quality video of the road ahead. The Snooper records a 152 degree wide angle view of the road ahead. The windscreen mount also rotates to a maximum of 360 degrees on the windscreen bracket so you can easily capture your chosen view of the road ahead and should you need to redirect the direction of recording this is simple and straightforward. 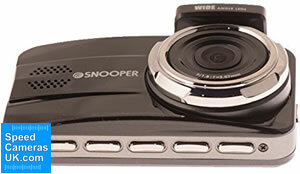 The Snooper dash cam includes a microphone which can optionally be switched off. Furthermore a time and date stamp is recorded on all vides which can be turned off. Protect your driving licence with Snoopers speed camera database. Furthermore the Snooper DVR-4HD will help protect your no claims discount on your driving insurance by ensuring you have the evidence of incidents and accidents recorded which can be used as evidence. Driver fatigue warnings are provided when you are making a long journey whereby you will receive a reminder to take a break from driving. There are also forward-facing collision and lane departure warnings that are provided by the Snooper DVR-4HD. There is an in-built G-Force Sensor that will ensure video is saved when an impact or heavy braking is detected. When a high G-Force is detected, the Snooper will save the video 15 seconds before the high G-Force and 15 seconds after the high G-Force is detected. This ensures you will always save video when it matters the most. ‣There is also a G-Sensor for detecting collisions and the in-car camera will start recording in the event of an impact-detection. The DVR-4HD in-built speed camera detector will display the speed of your vehicle when you are driving. As you approach a fixed or mobile speed camera in the database, the screen will change to display the type of camera in the road ahead and the device will start beeping at you. United Kingdom, France, Germany, Austria, Switzerland, Denmark, Norway, Finland, Sweden, Poland, The Netherlands, Belgium, Luxembourg, Spain, Portugal, Italy. You can also set the Snooper DVR 4HD in-car camera to warn you when you are travelling above a certain speed. Simply set the limit and the device will beep when you are above the set speed limit. Please note: *Due to the vast amount of speed camera data with the AURA database, the Snooper DVR-4HD will not accommodate the complete worldwide AURA speed camera database. Therefore you will need to select which countries you actually need to download e.g. if you are only going to use in the UK, there is no point in downloading/updating the rest of Europe. The AURA database can be downloaded to the device via a PC connected to the Internet with USB connection. ‣Mobile speed camera locations as included within the downloadable AURA database. Learn even more about the Snooper DVR-4HD by reading the manual. Click the PDF logo below. The manual opens in PDF format. Snooper DVR-4HD - What's in the box?